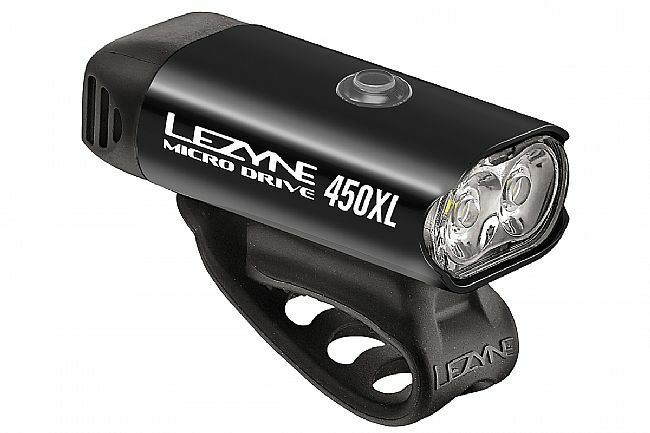 Lezyne's Micro Drive 450XL is a multi-purpose performance LED cycling light with compact, durable and heat-dissipating CNC machined aluminum construction and ultrahigh-output LEDs delivering up to 450 lumens. The Optional Overdrive Race Mode toggles between Overdrive and Economy modes for ease of use. Mode Memory function returns the light to the mode that was selected before it was last turned off. Heat-dissipating CNC machined aluminum construction. MOR (Maximum Optical Reflection) lens with built-in side visibility. Round and aero bar compatible strap mount. Smaller, lighter, and brighter than its predecessor. And at a smokin sale price! Cant beat that. Pros This light is super small and very easy to attach. I like the usb built into the light, you don't have to find a cord or adapter to charge it. The brightdim toggle is great for saving the battery. Reaches full charge super fast. Cons It only lasts a short time on high intensity, which isn't much of an issue for me because my commute is about 30 minutes. If your ride is longer than that and you don't have something like ambient street light to help you see, you should look for something with a longer battery life. This light is amazing, I'm loving it. I gave this 4 stars because I felt the mounting strap is cumbersome. It would be better with a clip -on type so you could leave it attached and just remove the light. I had a silver Lezyne 400 which was nice, but this one is better. The two bulbs illuminate a wider path than just one does. I usually pair two low-cost front lights to get better illumination, but with this one I don't really need to do that. When it's on sale, you won't find better. Gets the job done for my daily commute. This light is a huge upgrade over my previous one. I picked it up during one of the holiday sales and am pleasantly surprised with its performance at such a low price point. Battery life has been great using one of the pulse modes for my daily commute. I highly recommend if you can grab it on sale. I found this item an excellent way to catch drivers eyes as they pull out of side street. Long lasting battery even on the blast mode.